Sun Prairie City Hall is located at 300 East Main Street, Sun Prairie, WI 53590; phone: 608-837-2511. Photo: Adam and Mary Smith House, ca. 1872, Sun Prairie, WI. The house was renovated and relocated in 2004 a short distance to the east and now sits prominently in the "town square" of a new urbanism neighborhood called Smith's Crossing. Listed on the National Register of Historic Places in 1998. Photographed by User: Larkworb (own work), 2001, [cc-by-1.0 (creativecommons.org/publicdomain/zero/1.0/deed.en)], via Wikimedia Commons, accessed January, 2015. The first settlement in the Town of Sun Prairie was made by Charles H. Bird in the fall of 1839. Early the following year came Robert Marks, Charles S. Peaslee, Benjamin Knight, Reverend Albert Slingerland, John Winsled, Horace Potter, W. Van Bergen and John Ostrander, locating in the northwest part of town. In the southern part, Enoch and Bradford Churchill, W. A. Pierce, John Taylor, Ira Balch, Tisdale Pierce, Calvin Fowler, Mark Haslett and John Phillips formed a little settlement in 1840. Samuel Asahel and Charles Bailey and R.T. Cameron arrived in 1841. 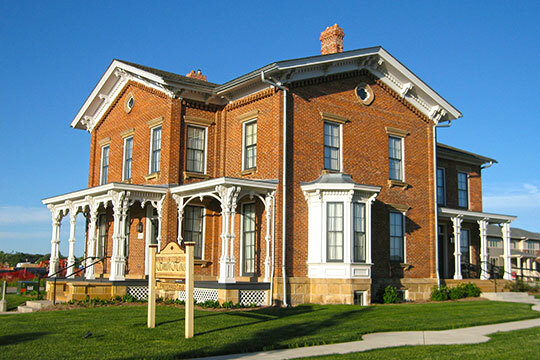 The Town of Sun Prairie was organized in 1846 and included all that district which constituted the towns of York, Median, Bristol and Sun Prairie. The first town meeting was held in the spring of that year at the house of John A. Peckham. To a great extent the history of the Town of Sun Prairie is a history of the village of the same name. In the year 1844, William H. Angell purchased 5 acres of land from Mr. Bird, being the first lot of ground sold in the present village of Sun Prairie. The idea was then conceived of founding a village here. The first step taken was to secure a post office. A petition was accordingly presented to the Post Office Department and their request was promptly granted, and an office was established under the name of Rome. This name was retained for about one year when the office was given the name of Sun Prairie. William H. Angell was the first postmaster and served until 1850. The first money order issued from this office was made July 15, 1869 to Michael Hawkins in favor of Shadbolt & Boyd for the sum of $30. The first regular attempt at merchandising was in the fall of 1845, Edwin Brayton opening a small stock of goods in the building erected by Mr. Angell for his carpenter shop. In June 1848, Silas Smith came to the place and rented the building formerly occupied by Mr. Brayton, and opened a stock of general merchandise. Patrick Doyle was the first "village smith," and opened his shop here in the fall of 1846. The early settlers in this vicinity were firm believers in the public school system of the country, organizing a school district here in 1842, erecting a schoolhouse and having classes in session the same year. In 1859, a railroad line was projected from Milwaukee to the Baraboo Valley; it was completed as far as Watertown. The line was located and graded about 3 miles south of the Village of Sun Prairie; but the route was afterward changed and in September, 1859, the railroad was completed to the village. Then followed a period of active business prosperity. Sun Prairie was the western terminus of the Milwaukee and Baraboo Valley Railroad for 10 years and was one of the largest and most flourishing inland grain markets in Wisconsin. Two large elevators were erected in 1859, one by William H. Angell and the other by Mann & Atkins. History of Dane County, Wisconsin, Western Historical Company, Chicago, 1880.